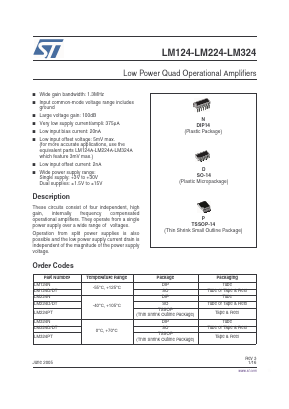 These circuits consist of four independent, high gain, internally frequency compensated operational amplifiers. They operate from a single power supply over a wide range of voltages. Operation from split power supplies is also possible and the low power supply current drain is independent of the magnitude of the power supply voltage.